Beautiful new painted tri_level house with 3 bedrooms, 2 bath, attached 2 car garage and big fenced yard. Stunning living room with new hardwood floor. Large eat-in kitchen with built in cabinet leads to park like back yard.Updated bathroom with new vanity top. Hardwood floor in 3 bedrooms on 2nd level. Lower level family has one bath room. New blinds for all windows. Fenced yard with shed. 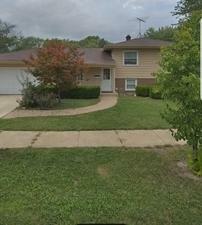 Close to shopping and schools.